Diet pills may not directly affect your period, but they can indirectly affect your menstrual cycle. Your diet plays a vital role in the function of your period. If you consistently neglect eating a healthy diet, your periods can eventually stop. When this occurs, it is not natural. It is only normal for your period to cease in other instances, such as pregnancy, menopause and while exclusively breastfeeding. If your periods become late or completely stop, talk to your physician. Diet pills have side effects, such as nausea, dizziness, loss of appetite and diarrhea. Dysfunctional menstrual cycles aren't typically listed as a side effect. They may occur, but it is not as a direct result of taking a diet pill. 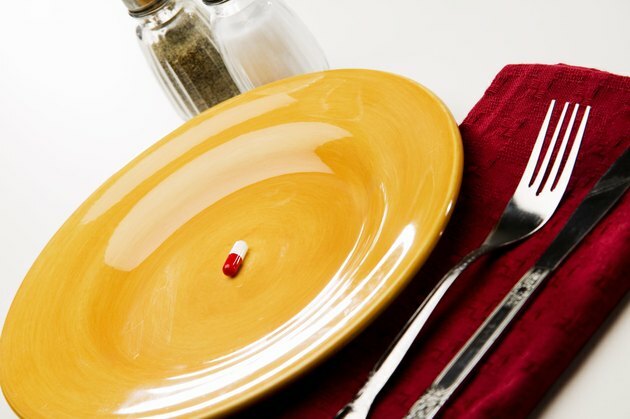 The majority of diet pills work by suppressing your appetite. When you do not consume enough nutrients and calories, your body begins to think it's going into starvation mode and acts accordingly. Poor nutrition can actually cause your periods to stop, according to the American Academy of Orthopaedic Surgeons. The AAOS explains that poor nutrition accompanied by a low-calorie intake, high-energy demands and a low percentage of body fat can cause amenorrhea, or the absence of menstrual periods. When you do not eat enough food, as a result of taking an appetite suppressant, you can miss your period or it can be delayed. Drastic weight loss can also cause you to have a late period or miss it completely, according to National Institutes of Health. Drastic weight loss may occur as a result of taking an appetite suppressant or a diet pill that contains stimulants. Stimulants typically give you more energy than you would normally have, which causes you to become more active, which leads to more calories burned. Increased physical activity, or exercising too much, can also affect your menstrual cycle. Never begin any workout regimen without physician approval. If you think that your period is late because of increased physical activity, or working out too much, talk to your physician. You may need to alter your workout program and utilize a more conservative workout. Can Stopping Exercise Make Your Period Late?